Is it clever to talk about contract negotiations when the club is in the situation it is in right now? After the most inauspicious start to the season since Wenger has been in charge, it is no wonder the captain would want to deflect from any talk of his future. This is a time to focus on the squad and the long arduous season ahead. Although it could be deemed as unrealistic to speak of a title challenge at this point, being 9 points behind the Manchester teams, it would be foolish to write off Arsenal’s chances in securing a top 4 position at the end of the season. That is something I (and I’m sure most of us) would take gladly if handed on a platter right now. Unfortunately, that is not how the world works. Finishing in the top 4 is no longer something we can take for granted. Blood, sweat and tears have to be shed to pull it off. This is something Robin clearly recognizes. The Dutchman still has two seasons to go on his current contract on which he is reportedly being paid 70,000 a week, 20 grand less than what was reportedly being offered to Nasri by the club in his new contract negotiations this past summer. Considering the Dutchman’s contribution during his time at Arsenal, 70K a week sounds to be a reasonable amount of money for a player of his class and calibre especially when you factor in his extensive injury record (Damn you Dutch DNA!). Who knows how much his weekly pay would be now if he was actually fit for most of the past 5 seasons? This is something we gooners love to speculate on: “What would Arsenal have achieved if Robin had been around for most of the season?” Fortunately for us, we did manage to get the semblance of half a season out of a fit Dutchman last year. During a period of time when it seemed most of the rest of our squad took an early start to their summer break, Robin kept our chances of Champions League football alive. The striker scored 26 goals in 31 games in 2011 at a rate of one goal every 100.3 minutes of playing time. To further illustrate the magnitude of this, the league’s top scorers Berbatov and Tevez scored 20 goals last season. Robin scored 18. He also set a new Premier League record by scoring in 9 consecutive away games between January 1 and May 22. In addition to his club tally, he scored 6 times for Holland during the calendar year. Considering how our summer panned out, it is understandable that anxiety levels are rising as some of our players are nearing the end of their contracts in the next few years (Walcott, Song, and Vermaelen being the others who will need to be drawn into negotiations in the next year or so). Arsene is no doubt going to avoid another Flamini or Nasri situation and aim to have them tied down to new contracts by the end of next summer. And yes, this is in addition to dragging our team out of the abyss of the bottom half of the league table and into the top 4. Additionally, anxieties have not been calmed by the news that Robin’s new agent is the infamous Darren Dein. Dein is no stranger to the Arsenal faithful and is the agent behind some of our recent scarring departures – Cesc, Nasri and Clichy. He was also a good friend, best man and agent to one Thierry Henry who he helped leave for Barcelona back in 2007. Even though this detail is a cause for Arsene and the board to worry about these upcoming contract negotiations, it is also important to note that Robin’s situation is different from Dein’s other clients. Firstly, Henry was nearing the end of his peak form and was led to believe that the Arsene could leave the club after the departure of David Dein when he opted for the sunnier climes of Barcelona. This is speculation Arsene has firmly squashed recently when doubts were raised again about his own future at the club. Although many fans were sad to see an Arsenal legend leave at the time, most understood it was for the best for the club and the player. Much of the same sentiment was felt when it came to Clichy’s departure. Although he had left the club accomplishing much less than Henry had, the vast majority of fans and clearly the club felt it was best for him to just move on. As amicable as the Thierry departure was, the Fabregas saga on the other hand was fuelled with much speculation and outrage from both fans and English and continental media. I’m fairly certain half the Amazon had to be torn down to provide for the rags that kept that story spinning for the best part of three years. The prodigal son wanted to leave. He wanted to go back home. This is something that Arsene recognized when he was asked about Robin’s situation this weekend. His eventual departure this past summer marked the end of an era and has set the club on a completely different path when it came to signings. Nasri’s departure, on the other hand, generated a level of fury and venom I hadn’t seen since Adebayor left for City. The parallels between those two players and the way their transfers panned out are quite remarkable when you look back on it. It is also interesting to note the similarities between them and Robin. All three were termed ‘difficult’ and temperamental when they first joined the club but most were convinced that a manager like Arsene Wenger could get the best out of them. And that he did. However, unlike Nasri and Adebayor, Robin has matured greatly from the temperamental boy who had been kicked out of the Excelsior youth system. Even current Dutch coach Bert van Marwijk (who was his coach during his tumultuous years at Feyenoord) has been singing his praises. Robin himself has called Arsene his second father in numerous interviews. After all, the man had given him the chance to prove himself in one of the clubs of his dreams (the other ironically being Barcelona – VIDEO). He has recently been quoted saying that the only club he would ever leave Arsenal for is Excelsior, where he would play his last years before retiring. He has also been vocal about his disapproval of policies used by clubs like Man City, Real Madrid and the ilk. After all, this was a man who had taken his girlfriend and now wife Bouchra to McDonalds on their first date! 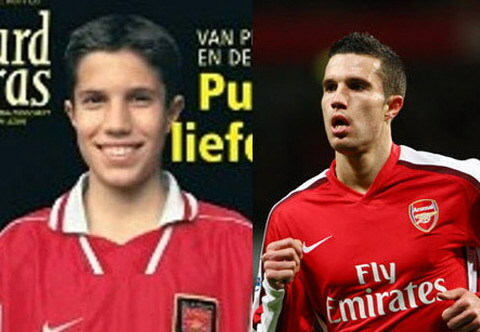 Robin van Persie is Arsenal and Arsenal is him. This is, after all, the club that kept their faith in him through what he described as being some of the hardest years of his life and he has done his bit in repaying this faith in the last 10 months. Not only does he lead by example, he is also vocal both on and off the pitch. From giving Diaby an earful for picking up a careless card during half time at the Blackpool game last season to the now famous bust-ups with Vermaelen and Arteta. It is impossible to deny that he is passionate about the club and we sometimes get a glimpse of the feisty teenager he was back in Rotterdam. As supporters, there is not much we can do to affect player negotiations and continuing to feed into the media driven hysteria that has surrounded the club for much of this year does no good for anybody but the rags. So the next time you have the privilege of watching the Arsenal, sing as loudly as you can and ensure the team that you are behind them 100 per cent. After all, Robin van Persie “play(s) for love, not money”. *Credit for the statistics goes to Arsenal’s statistician Josh James and the good folk at Opta. Thank you Gabi! I hope so too! Thank you Day! I hope so too. I think he owes us one.